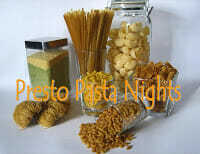 I am submitting this post to Presto Pasta Nights. Ruth, the genius behind PPN and blogger at Once Upon A Feast is hosting the event. Hop on over there tomorrow to see the round up of pasta dishes people made this last week. Next weeks host will be Kirsten of Kirsten’s Kitchen to Yours. If your making a pasta dish this coming week and want to join in, make sure to submit your entries to her by Thursday, October 13, 2011. You can read the guidelines for submission over at the PPN site. Hope to see you there, after all, who doesn’t love pasta? 1/2 box dried pasta (about 7 ounces) or use fresh pasta (our favorite), cooked until al dente. Melt butter over medium heat until bubbly. Add dried chili peppers and cook for about 1 minute (be careful not to burn the butter). Add the minced garlic and scallions and saute about 1 minute, until softened. Mix together brown sugar, fish sauce, and oyster sauce. Add to butter mixture and cook for 1 minute or until sugar is dissolved (this doesn’t take long). Add pasta to the sauce and toss to mix. For some color, toss in the green part of the chopped scallions. Serve & enjoy! 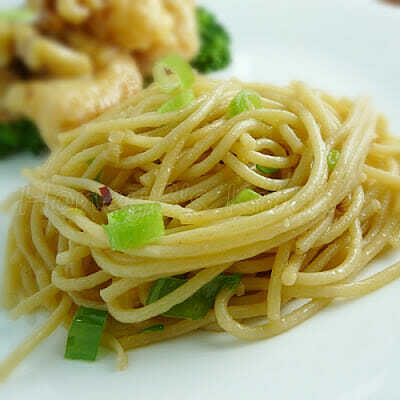 Sesame Peanut Noodles – this is a yummy weight watchers recipe! Light and Hearty Tuna Noodle Casserole – Grumpy loves tuna noodle! I would be so appreciative if these noodles showed up at my tabble. I love the fish sauce and oyster sauce in it. Together with the garlic I am sure it is scrumptious! You said it! Sweet Heat! This pasta sounds awesome! I just love what oyster sauce does for any noodle or broccoli even chicken everything taste better… this sounds great Shelby! 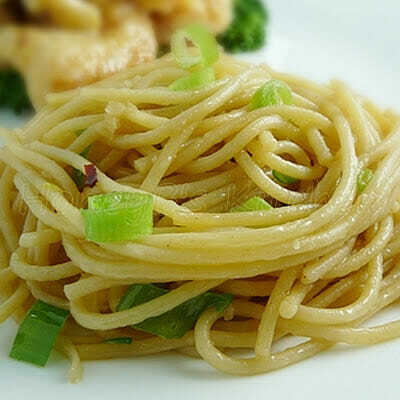 Love garlic noodles…that looks incredibly delicious! I love these from the Steamy Kitchen cookbook. Delish! Love the sweet heat. I love garlic noodles! I like your recipe too! 🙂 Your blog is great – lots of almond recipes – one of my favs!! !